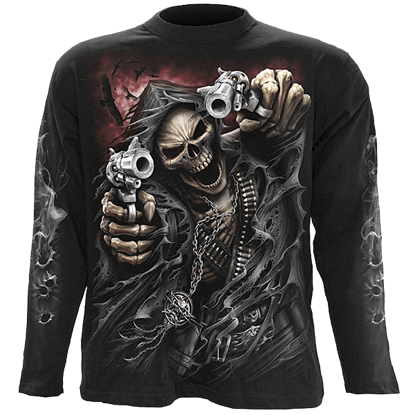 We offer a variety of skeleton and skull t-shirts that are brimming with scary levels of style! 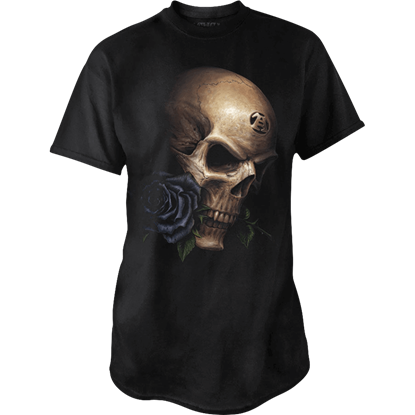 In our skull t-shirt section, you will find dozens of comfy, casual, everyday t-shirts that feature grim reapers, skull heads, or skeletal monsters as their central themes. 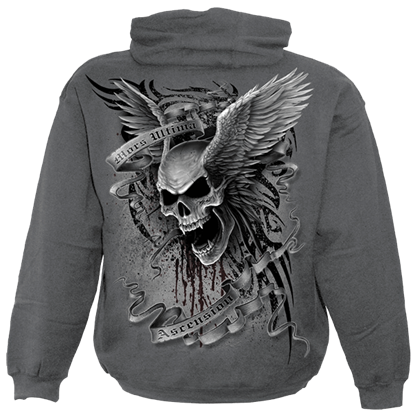 Our variety of skull t-shirt designs is incredible, and you will find bloody red skulls melted by acid rain and spider-webs spun into the shape of skulls here. 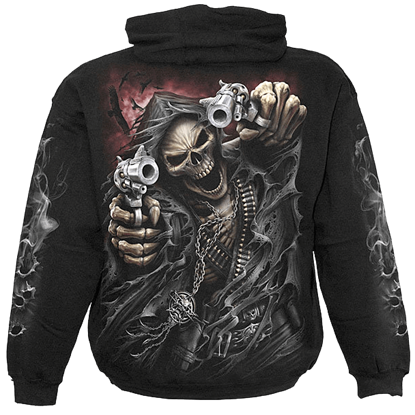 We have fearsome grim reaper graphic t-shirts and t-shirts made to look like your own skeleton is showing when you wear them. Some of the skulls featured on these shirts are not even human! 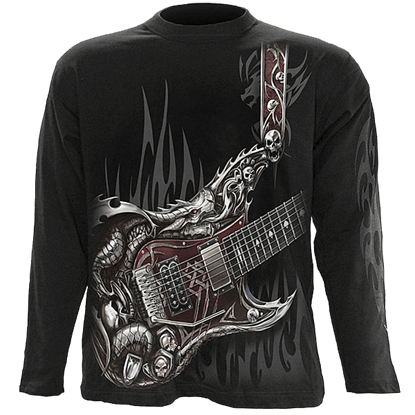 We offer skeleton t-shirts for men, women, and even children in this category. So if your style demands skulls and skeletons, or you simply find yourself delighted by one of these gothic designs, then you are in the right place. Having just completed his Opus Magnus, the renowned philosopher known as The Alchemist, holding the Black Rose of Perfection in his mouth, looks down at his achievement. This is the image shown by the Alchemist Askance T-Shirt. The darkness may become a comforting presence after witnessing the horror revealed by the light of this candelabra. 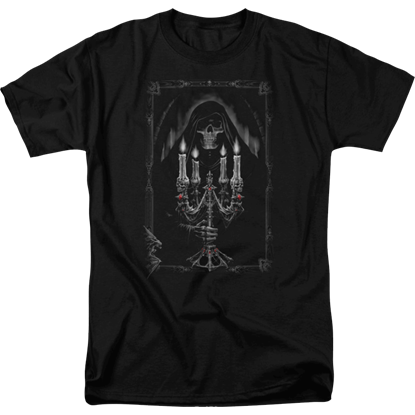 The Anne Stokes Candelabra T-Shirt depicts a gothic picture in her iconic artwork style on the front. Some might say that all of life is a dance with death, flirting with danger with each blind step. 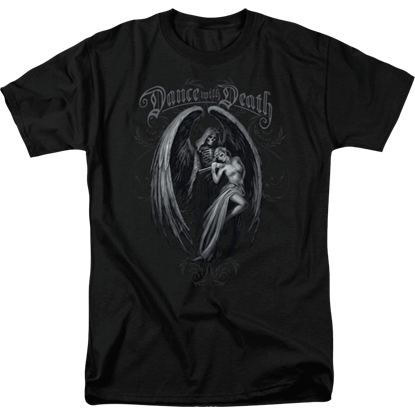 The Anne Stokes Dance with Death T-Shirt takes this concept to new heights by depicting this fatal dance in a literal sense. While the prospect of spending eternity in hell frightens some, this dark figure shows no fear in its grinning face. 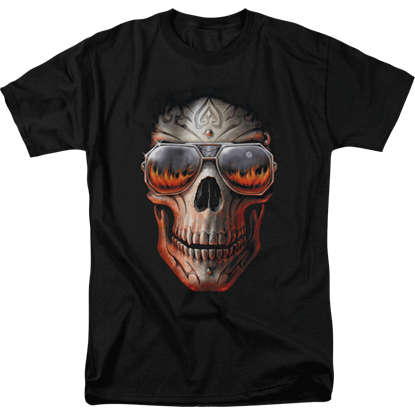 The Anne Stokes Hellfire T-Shirt displays a skull with roaring fire reflected in its sunglasses. No one ever knows when their time will be up. 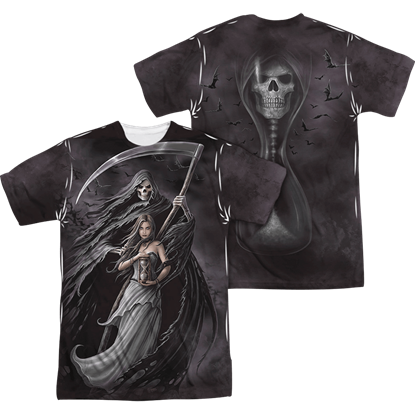 The Anne Stokes Summon the Reaper T-Shirt offers a reminder of this grim fact with the sand timer held in the hands of the young female companion of the skeletal grim reaper. Mors ultima linea rerum. 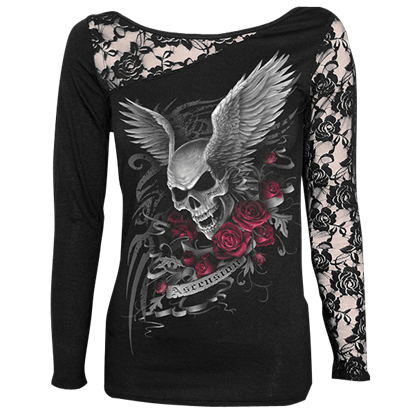 Death is the ultimate boundary, and in this Ascension Skull Womens Lace Shoulder Shirt, death, as a skull, ascends past this border on white wings, leaving behind things that are mortal and fated to pass. Mors ultima linea rerum. 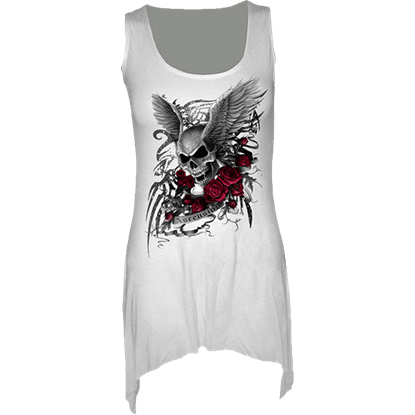 Death is the ultimate boundary, and in this Ascension Womens White Gothic Dress, death, embodied in a skull, ascends past this border on white wings, leaving behind things that are mortal and fated to pass.